Poor line management is recognised by workplaces as having a negative impact on the performance of the business. A report by the CIPD and the UK Government published in 2012 revealed that more than two-fifths of managers regard their own line manager as ineffective. Meanwhile, a 2012 study from the Chartered Management Institute found that 43 per cent of managers are rated as ineffective or highly ineffective by staff. The effects of poor management can harm the growth and competitiveness of a business. Research has shown that poor management can have a detrimental impact on employee engagement levels within a business, which in turn affects employee retention and performance, customer service and satisfaction, and business performance. To deal with these issues, the UK Government has set up a new cross-party Parliamentary Commission to examine why so many line managers are “failing” their employer. The All-Party Parliamentary Group on Management (APPGM), in partnership with the Chartered Management Institute (CMI), will examine how management can be transformed to drive growth across UK businesses to boost the economy. The commission will attempt to highlight where employers have successfully used innovative approaches to management that have helped create growth and increase employee engagement. The most innovative and successful businesses will be invited to discuss their techniques with the Commission in Parliament. The commission plans to report on their findings in 2014. For me, it is really positive to see the Government attempt to deal with the issue of poor management. 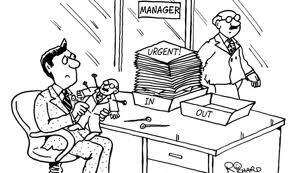 Too many businesses are being held back by line managers not having the required skills to lead their people properly. Hopefully the work by the Commission will lead to the provision of training and support networks that UK businesses can tap into for their managers. This will especially benefit the smaller businesses that don’t have the expertise or resources to tackle the problem of underperforming managers.